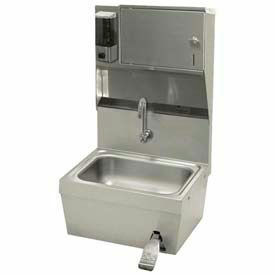 Commercial Hand Sinks & Wash Fountains from Elkay, Bradley and More. 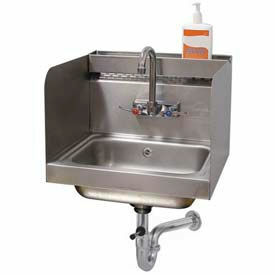 Wall Mount Hand Sink 14 X 10 X 5 (Includes Faucet) Is Used For Environments Where Hand Washing Is Required. Wall Mount Hand Sink 14 X 10 X 5 (Includes Faucet) is constructed with 16 gauge Type 304 stainless steel with a #4 finish for maximum corrosion resistance and long lasting durability. Bowl measures 14 inch W x 10 inch D x 5 inch H. Features 7 inch gooseneck faucet, 8 inch high back-splash and removable basket type drain. Faucet mounts on 4 inch centers; 1/2 inch hot and cold supply. Unassembled. Size is 15 in. W x 5 in. D x 17 in. L. Color finish is Gray. Compartment quantity is 1. Standard Wall Mounted Hand Sinks Are Used For Classrooms, Laboratories, Studios And More. Standard Wall Mounted Hand Sinks are made using stainless steel for lasting durability and resistance to corrosion. Faucets (sold separately) mount on backsplash. Wall brackets included for easy installation. Available in a variety of styles and configurations. Pedestal Hand Sinks Are Used For Applications Including Medical, Laboratory, Educational, And More. 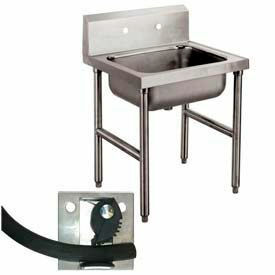 Pedestal hand sinks are made of stainless steel for long lasting durability and corrosion resistance. Sinks allow hands-free water access for contamination prevention. Faucet activation options include foot pedal valve or sensor operation. Optional features include integrated paper towel holder and soap dispenser. Available types include Complete Unit, Large Bowl, and Remote Unit. Gauges are 18 and 20. Color finishes are Silver and Steel. Dimensions vary per model. Advance Tabco Multiwash Hand Sinks Are Used For Laboratories, Studios, Workshops And More. 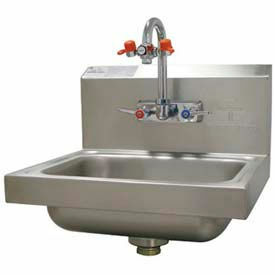 Advance Tabco Multiwash Hand Sinks are made using stainless steel for lasting durability and resistance to corrosion. Sinks feature wall mount installation and are available in a variety of lengths. 24" model features one faucet hole. 48" and 60" models are made with 2 faucet holes. 72" model has 3 faucet holes. 96" model is made with 4 faucet holes. Knee Valve Assembly Kit sold separately. 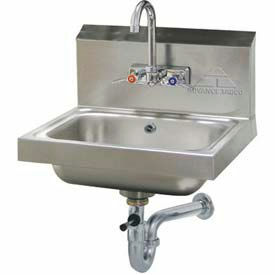 Hands Free Sinks Are Used For Industrial Or Commercial Applications. 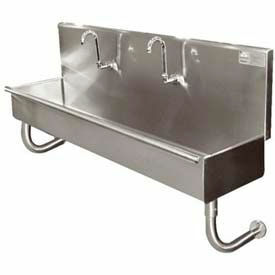 Hands Free Sinks are made of 20 gauge steel for long lasting durability. Wall Model W/Skirt measures 9" Wide X 9" Front-To-Back X 5" Deep. 8 inch backsplash, splash mounted faucet and knee valve provide optimal performance. 1-1/2" Flat-Top Strainer. Available in Hands free Knee Operation, Standard Hands Free, and Body Activated unit. Silver finish. Advance Tabco ADA Compliant Hand Sinks Provide ADA Accessibility. Easy Connection Between Water Supply And Fixtures. 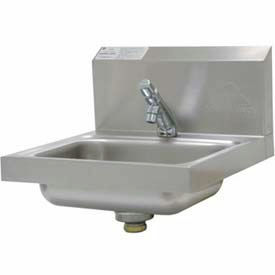 ADA Compliant Hand Sinks are made of 18 gauge stainless steel construction for long lasting durability. Wall model measures 14" Long X 16" Front-To-Back X 6-1/4" Deep. 3 hole punch and basket drain provide optimum performance. Available with AC/DC operated faucet, Bracket and Side Supports, Deck Mounted Wrist Operated faucet and Faucet, Soap and Towel diespenser. Wall brackets included. Silver color finish. 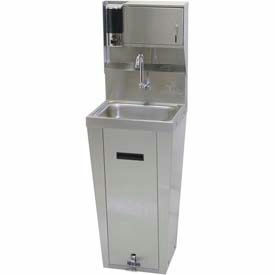 Portable Hand Sink Is Used For Large Outdoor Community Functions When Hand Washing Is Required. Portable Hand Sink is constructed with 18 gauge Type 304 stainless steel with a #4 finish for maximum corrosion resistance and long lasting durability. Includes two removable 5 gallon fresh water tanks and two removable 7.5 gallon waste water tanks. All tanks and components secured in locking cabinet with recessed handle and cylinder lock. Counter top includes backsplash with built-in soap dispenser and paper towel rack. Powered using GFCI-protected 12 foot L power cord. Includes 120v 2 imp. gallon water heater. City water and drain hookups provided for ease of operation. 2 rigid and 2 locking swivel casters allow easy mobility. CSA approved. NSF listed. UL listed. Fully assembled. Size is 34-3/8 in. W x 25-1/4 in. D x 47-3/4 in. H. Color finish is Stainless. Compartment quantity is 1. Amps are 12. Voltage is 120V. 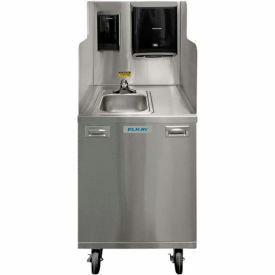 Soap & Towel Dispenser Hand Sinks Are Used For Classrooms, Exam Rooms, Laboratories And More. 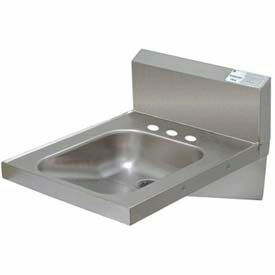 Soap & Towel Dispenser Hand Sinks are made of stainless steel to provide long lasting durability. Available styles include Wide Hand Sink, Wide Space Saver, Wide Hand Sink w/Eyewash, Knee Valve Hand Sink, All-in-One Unit, Skirt Unit and Upgrade Unit. Dimensions vary per style. Freestanding And Wall Mounted Service And Mop Sinks Are Used For Applications Including Maintenance, Janitorial, Commercial And More. Freestanding and wall mounted service and mop sinks are made of stainless steel for long lasting durability and corrosion resistance. Sinks allow convenient rinsing, cleaning and overall content maintenance. Unit features deep basin and backsplash for spillage prevention. Faucets sold separately. Available types include Freestanding and Wall Mounted. Color finish is Silver. Dimensions vary per model. Wall Mounted Hand Sink, HACCP Compliant, Wall Model, 14"W x 10", 17.25" x 17.25" x 13"
Wall Mounted Hand Sinks are made using stainless steel for lasting durability and resistance to corrosion. Sink features slow self-closing metering faucet with mixing valve and basket drain. 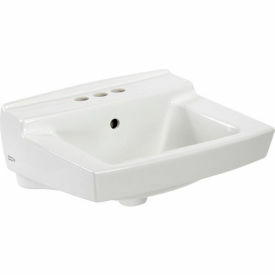 Sink is wall mountable and H.A.C.C.P compliant. 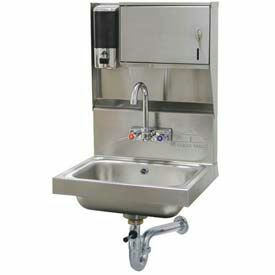 Hand Sinks With Side Splashes Are Used For Medical Facilities, Laboratories, Exam Rooms And More. Hand Sinks With Side Splashes ensure water and debris is contained within sink. 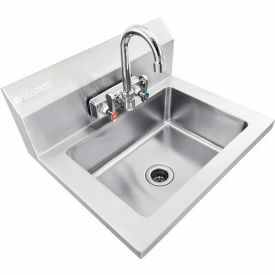 Sinks are made using stainless steel and are available in a variety of sizes and configurations. Wall Mounted Hand Sink With Single Hole Punch For Faucet, 20 Ga.